Our home, a beautiful 1982 Vagabond 42. I don’t always tell people that I live on a sailboat. Its not because I am embarrassed (because I really LOVE it), but rather, a lot of New Yorkers just do not understand why anyone would do anything so unconventional. Why would anyone choose to live on a boat over in the comforts of a NYC apartment? Immediately images of camping come to their minds, and “how do you shower?” or “can you go to the bathroom on it?” come pouring out of their mouths. The reality is that living aboard a small boat in NYC isn’t roughing it. In fact, it may be one of the most luxurious living arrangements I’ve ever had. Reason 1: It’s cost efficient. For those of you who have never been to NYC, people live in much smaller spaces than they do in the rest of the country, and they pay a LOT more money for it. I have friends that happily pay $2,500 for a one-room studio in a not-so-nice neighborhood. The scary thing is they think that is a steal. Our $800 a month slip rent, while pricey in comparison to slip fees across the country, is minuscule for NYC rent. Reason 2: We have more living space and better amenities. Our boat in its current configuration is a 2-bedroom, 2-bathroom with a 3rd room converted for our workshop. The front room has bunk pilot berths, and the aft cabin has a queen size bed. Each bathroom has a toilet and its own shower. Our kitchen has a stove, oven, fridge and microwave. We didn’t even have a microwave in our last apartment. We even have “central” air and heat – something that is definitely not the norm in NYC apartments. See, living on a boat is an upgrade! Who is ready for some downward dog? Reason 3: We have outdoor space. In addition to the interior space, we have a sick amount of outside space to play on. We don’t have to pick between a rooftop or a balcony that we would have to pay for at a premium, we have both. We have our entire cockpit, the aft deck and fore deck that all get a ton of use. The aft deck is a perfect spot for my morning Pilates, while the fore deck seems to be the perfect spot for hanging our hammock to watch the sunset. Reason 4: You cannot beat the location. We have the best combination of all the prime NYC real estate situations – we’re a waterfront property with a skyline view near a huge park. Seriously, the location couldn’t be better and the view is honestly the best I’ve seen in all of NYC! We watch the sunset bounce off the skyline and then kick back with a glass of wine while we wait for the fireworks show to start that the marina seems to always have. It is spectacular. An insane sunrise view of the skyline as seen from the upper deck of Liberty Landing Ferry. Reason 5: It is an easy commute. One thing that seems to really baffle people is how we get to the city. While we don’t sail our boat to work every day (If I had a dollar for every time someone asked me this I could fund our entire renovation! ), our commute is better than ever. Jason works downtown and his entire commute comes in at 12 minutes. Seriously. I work uptown, so mine is a little longer but it is so much more enjoyable. We take the ferry into the city, and then I either hop on a Citibike or the subway to head up town. It really is quite convenient. We also have a ghetto van that we use for errands. We use it mostly to go to Wal-mart and Harbor Freight, but it is nice to have options. One of the best things about living on a boat is that our home is mobile. We don’t have to pack any thing, we just untie the dock lines and get moving. Home is literally where the anchor drops, truly the best way to see new places. Feel like heading up the Hudson River to go for a hike? No problem. Need to dip your toes into the sea? Let’s head to Sandy Hook for the night. There are so many adventures to be had! 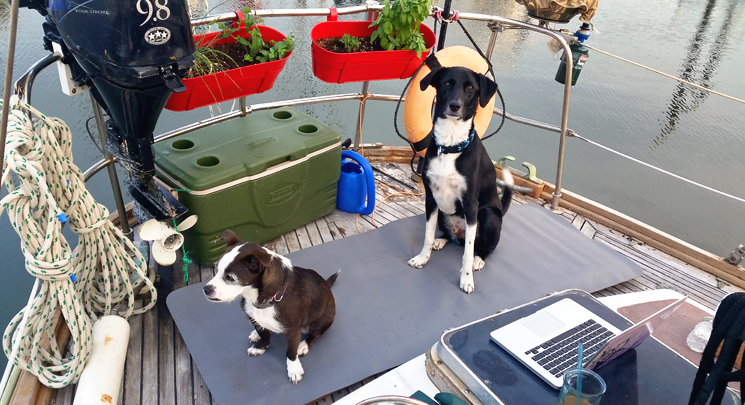 When we returned from our shakedown sail to the Bahamas, we tried a more conventional apartment life and even expected to get hooked to the conveniences of land life. Turns out we hated it and really missed the ways of life aboard. We got back on the water as soon as we could and have been living happily ever after since. 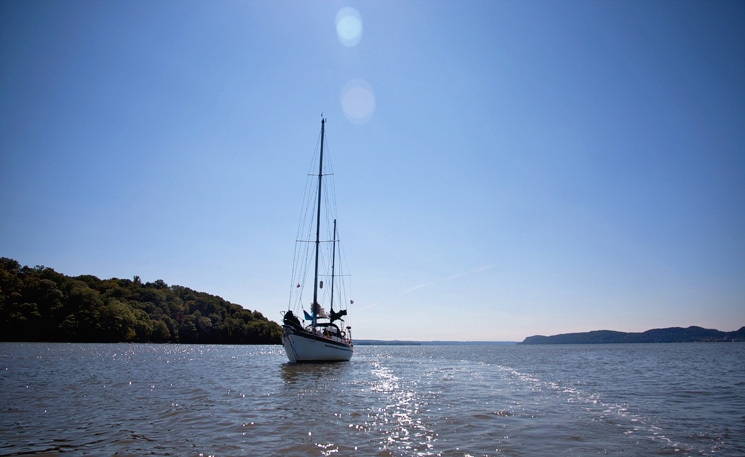 What are your favorite things about living aboard? I think you guys have got NYC living figured out! Relatively affordable “rent”, great views, indoor space and you can take your home with you. I’m surprised more New Yorkers don’t live on boats 🙂 And you even have a little herb garden going on – sweet! Good one Kelly! My brother in law lives in Brooklyn and pays sooo much in rent, I think you guys have it figured out. Rents are going so high in the Keys now that we have been considering getting back on a boat after the little one arrives. Miss it everyday! One thing is for SURE: You’re doing it right in NYC! That’s a really cool assessment of your living situation. I would love to sail to NYC – we just have to find more time! I also like feeling more in touch with the weather, good or bad, it keeps you a little more connected to nature. Glad you are back aboard! Oh and that skyline photo is AMAZING!! Seems like you guys have the best of both worlds. You’ve got your big city, fast paced jobs on the one hand, and then quick as can be you’re being gently rocked in your home on the water! So glad we got the chance to meet the two of you while we sailed through NYC a few weeks ago! Hope we get the chance to hook up with you guys again sometime soon! Love your blog. Thanks for writing it and writing with such clarity and enthusiasm. I lived aboard for many years and never regretted a minute of it. Even got in two years as a kid, 6th and 7th grades while cruising. Living aboard and voyaging is very much a lifestyle choice in the same way choosing to live in Manhattan is a lifestyle choice. Amused to see “Skeleton Crew” commenting. I think we have raced against one another a few times. Still reading and rereading entries. thanks. Don’t stop.